Are you tired of the messy and ridiculously heavy Christmas wreaths that bang against your door every time it shuts? 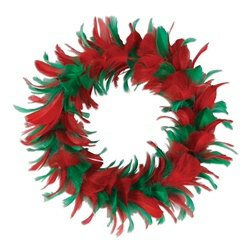 If you are looking for a nice substitute, go for this Red and Green Feather Wreath. This wreath is as light as a bag full of feathers, so it won't make that awful noise when you close your door. The Red and Green Feather Wreath is also a cool spin on the average Christmas wreath because it is made with feathers rather than out of pine needles. It is a stylish and modern take on a classic Christmas decoration. It is perfect for hanging indoors, especially if you live in an apartment building and cannot have pine.